Were it not for a twist of fate and a controversy within GM, this unique Corvette, if returned to the US, would have most likely met its end in the crusher! However, since leaving GM Styling in late September 1962 for London’s Earls Court show stage, it has never returned home. A barn find back in 1982, it has remained in a private collection in London for thirty years. The coupe arrived at GM Styling ahead of the main pilot line as a body and unnumbered frame assembly only. Identified by Styling data tag as S.O #10271 as early as May 62 on drawings found, marked 63 Corvette Custom (it is believed to be earlier). The complete floor pan, inner wing panels, lower front panel, doorsills and spare wheel tub are all hand formed GRP. Drawings list the Coupe at Interior Engineering in June referenced to Electric seats. Power seats had been tested in the XP720 coupe listed together with #10271. Bodywork finished in primer with numerous test siting/ locating holes for front, side and rear emblems. Experimentally trimmed in Silver leather with silver steering wheel and used for photography in the studio. All interior panels, remain the originals and are all marked with the S.O in black marker. Numerous trims and mouldings are hand formed in brass and chrome plated. Rear window mouldings are unique one piece construction in brass and chrome plated, retained by dozens of tiny brass screws. These one piece mouldings have been identified on GM archive footage and were also used on the prototype 4 passenger coupe. Numerous other interior differences as compared to known pilot line and production models. It is believed that there was no power plant or transmission installed at this time – a push/pull mule! The power plant is an incredibly rare,( one of only a few known) hand assembled Flint” Dyne Lab” engine, 59 283 290hp CS with unique 3758584 heads. Dyne lab inspection letters hand stamped to engine. As yet unidentified GM intake manifold. Engine painted red, detailed in red with various hand- made, chromed, GM engineering pieces. Engine bay shows experimentation with fuel injection. The larger radiator frame also suggests F.I but there is no frame cut out for the airway to plenum. The radiator has a small brass tag with SO T1 stamped into it and is copper and not aluminium. Transmission is a showpiece 4 speed M10 finished in ” Mitchell Blue”, unstamped. Bell housing is very first casting early type 3788421 but with no cast date or revision markers! A generator provides the current and not an alternator, as one would expect for 63. For reliability, an alternator is currently fitted along with a 63 fan to assist cooling. A full biopsy on the engine has never been carried out but it does appear incredibly lively! From GM Styling files, on June 28 62 the Coupe was sent for paint. A brilliant high metal flake Airframe silver (not Sebring as imagined). It was also re-trimmed in full, in black hand stitched leather, including doors, dashboard and headlining. Panels of the original Silver leather are still present today beneath the revised black covering. From July 62 the coupe was relisted on drawings as S.0 #10271 LONDON SHOW COUPE following a request for a show car by GM Canada. Various additional trim pieces were fitted including chromed door locks, unique chromed plates to inner and outer door shuts. Unique front side emblems. All fittings have S.O number engraved on them, some initialled and dated. Instruments are stamped “ Show Job” initialled and dated 16 July 62. 27th August 1962 Stamped as build date to trim tag. Body 13 and pilot line Vin Tag #23 added. Sometime in the latter part of September the show transmission was installed, however, the 59 power plant remained and the Coupe left Warren for England in time for the London Motor Show, 2nd week October. It was delivered in secrecy, under covers to Earls Court Stand 138 sponsored and administered by GM Canada. It was to be shown alongside A Corvair Monza Coupe and a 4 door Impala saloon. With 2 days to “ Press Day”, some GM execs from GM Canada’s European offices in London, visited Earls Court to see their latest offering up close. 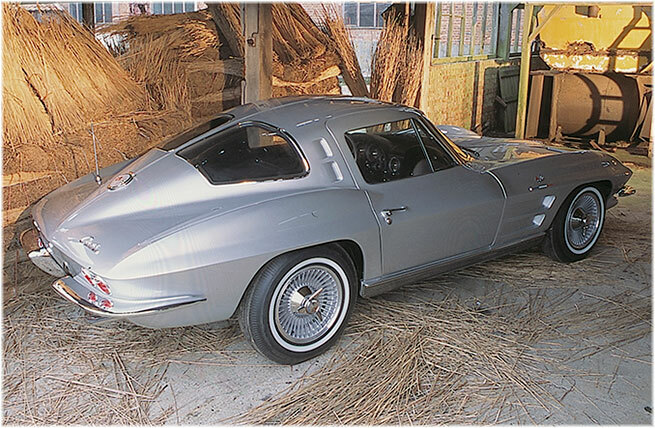 They were presented with a stunning Silver Corvette Sting Ray Coupe. Blind panic ensued when, upon opening the hood, it was discovered that the new car did not have a 360 hp fuel injected power plant, as ordered and publicised! A frantic effort to find a replacement began and a second Silver Coupe (most likely the Turin Show car en route) arrived at the end of press day! S.O #10271 languished under covers in a basement garage in central London for several months, until it was eventually registered for the road in January 1963. It is believed, but not confirmed that it was registered to GM in London as a company vehicle. It has been herein the UK since. With only 72,000 original miles it is still used but understandably only occasionally. It has only been shown once at Good wood in 2003, at the “Cartier Style Et Luxe” concours. As part of Corvette’s 50th alongside GM’s Mako Shark and others, it was awarded best in class. 2006. It took park in the Drivers Parade with GM racing at the 24hrs of Le Mans and completed a full parade lap of the Le Mans circuit. S.O # 10271 is quite unique. The only “63 Styling” buck. It is the earliest, fully documented “ Sting Ray”. It is also the earliest C2 S.O. car and the only 63 Show coupe in existence. With thanks to: Jerry Palmer, Chuck Jordan, Franz Estereicher and Ken Kaiser ex GM. To Jim Gessner and Noland Adams.